Pierce experienced great success with his first movie, The Legend of Boggy Creek (1972), a pseudo-documentary filmed in nearby Fouke, Arkansas, which was based on alleged sightings of a Bigfoot-type creature in the area. With The Town That Dreaded Sundown, he returns to similar terrain, both physically and metaphorically, using a similar style to tell the frightening tale of a monster on the loose. © 1976 Charles B. Pierce Film Productions, Inc. 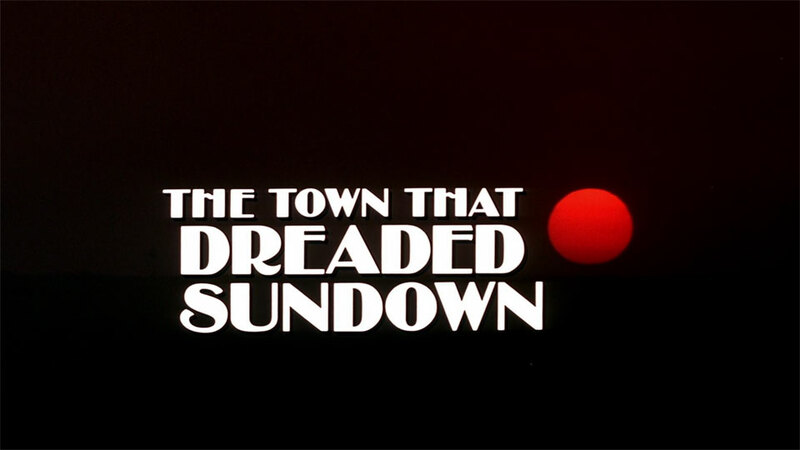 The Town That Dreaded Sundown was filmed primarily in and around Texarkana, where the original events had taken place. SPOILER ALERT: The descriptions below include plot points of the film. If you haven't seen the movie, you can buy the Blu-ray on Amazon. When I began researching these locations, I found an old Angelfire site devoted to The Town That Dreaded Sundown. The Filming Locations page was a big help, but the Photobucket account hosting the location photos is no longer sharing the pictures. That's how things work on the Internet, so I'm grateful that I found it when I did. The train station is the Union Station, 100 E Front St, Texarkana, AR 71854, and the “Hotel Artney” is directly across Front Street, as seen on-screen. The Paramount Theatre at the front of the Artney was a façade for the film. Reference: These sites were listed on the The Town That Dreaded Sundown fan site mentioned above. The Artney location had been the once-grand Hotel McCartney, but it had apparently ceased operations by the time of filming. 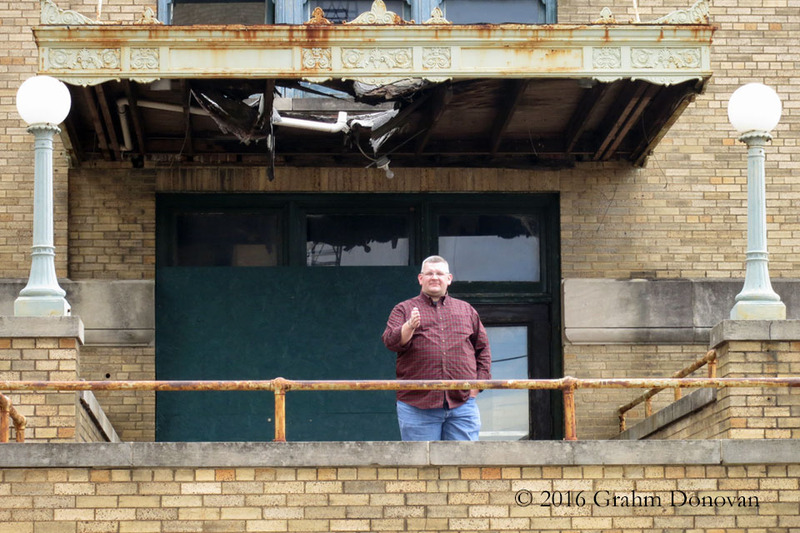 Sadly, both the Union Station and the Hotel McCartney have become considerably dilapidated over the years, so be cautious near the buildings. The opening montage contains a quick shot of the Texarkana College Auditorium as the voiceover mentions veterans returning from World War II and using the G.I. Bill. to attend college. The auditorium once stood at the Texarkana College, 2500 N Robison Rd, Texarkana, TX 75599. However, the building has since been demolished. Another scene showing a glimpse of post-war life features a happy, young couple exiting a church after their wedding, as guests toss rice at them. 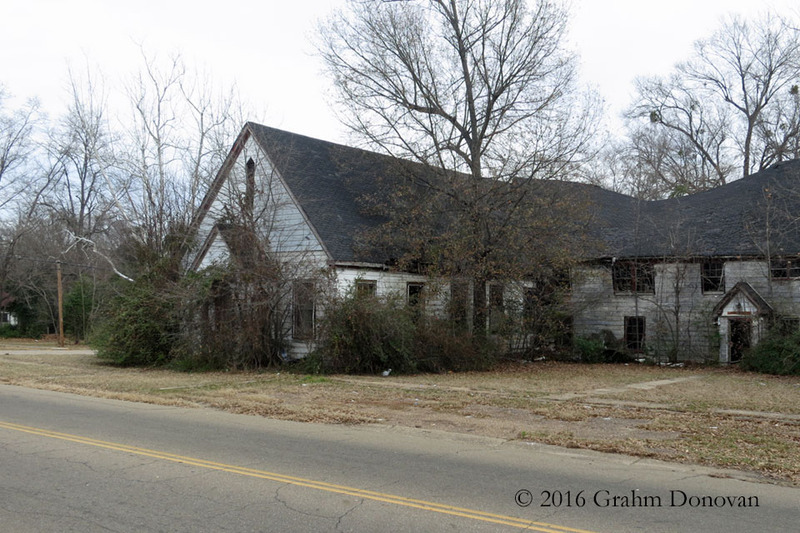 The church is located at W 14th St at Bowie St, Texarkana, TX 75501, and the building has obviously been abandoned for many years. Reference: I found this location on the Arkansas.com entry for The Town That Dreaded Sundown. The police station exterior is first seen on-screen in a nighttime shot on "Saturday, March 24th"
The Police Station exterior seen in the movie is located conveniently at the one end of the train station, as is seen several times. The police station exterior is clearly to the right side of Union Station, as viewed from the street. Exclusive: 'Sparkplug' is seen hitting the brakes at approximately 5399 Mandeville Rd, Texarkana, AR 71854, at the back gate of a cemetery. I determined this location by looking for cemeteries in the area, and I haven't seen this listed anywhere else on the Internet. Local students are shown arriving at a prom, and students are later are shown leaving the building, including two ill-fated lovebirds who plan to head to Spring Lake Park. The prom site is at 601 Locust St, Texarkana, AR 71854. It was obviously a former National Guard armory, but now houses the Texarkana Restaurant Equipment Exchange. Reference: This site was listed on the The Town That Dreaded Sundown fan site mentioned above. The Town That Dreaded Sundown has become a "cult classic" over the years, even leading to a 2014 remake. The original is occasionally shown around Halloween in Spring Lake Park, which is mentioned in the movie, and is near the site of one of the actual "Phantom Killer" murders. The attacks continue to fascinate, and they were the subject of the 2014 book, The Phantom Killer: Unlocking the Mystery of the Texarkana Serial Murders: The Story of a Town in Terror. The Town That Dreaded Sundown © 1976 Charles B. Pierce Film Productions, Inc.